Epilepsy or Brain Tumor ? Brain tumors can occur in any age dog, even puppies, but are most common in dogs older than 5 years of age. Any breed can be affected, but Boxers, Golden Retrievers, Doberman Pinschers and several other breeds may be at increased risk for certain kinds of brain tumors. A brain tumor often causes a gradual onset of progressively worsening signs, but in some cases signs can appear quite suddenly. The specific signs depend on which portion of the brain is affected. Seizures are common and may initially be the only sign. Vague changes in behavior are also common. Eventually, persistent neurologic deficits develop and may include weakness or paralysis, incoordination, walking in circles, tilting of the head to one side, and partial blindness. If a brain tumor is suspected, x-rays of the chest may be performed to look for tumors that may have spread to or from the lungs. Skull x-rays may be taken, but have limited value in identifying most brain tumors. Computed Tomography (CT) or Magnetic Resonance Imaging (MRI) is the most helpful diagnostic test. These procedures will usually identify the tumor and may provide clues as to the type of tumor. However, microscopic examination of a piece of the tumor obtained by biopsy may be required for definitive diagnosis and to rule out other diseases that can appear similar on CT or MRI. If a brain tumor is strongly suspected, specific diagnostic techniques should be considered early. A "wait- and-see" approach only allows the tumor to grow larger and the dog to become more debilitated, which decreases the chance of any treatment being successful. Corticosteroids to control brain swelling and antiseizure drugs to control seizure are often helpful. Definitive treatment is surgical removal of the tumor and/or radiation therapy. Chemotherapy is used for a few specific types of brain tumors. Treatment recommendations depends on many factors, including the type, size and location of the tumor and the dog's condition. Recent advances in neurosurgical techniques and radiation therapy have improved our ability to safely treat some brain tumors in dogs but in other cases the chance for recovery is poor. Diagnosis and treatment of this serious disease is usually best undertaken by specialists, such as neurologists, neurosurgeons, and radiation oncologists, often working together as a team. Brain tumors are the most common cause of seizures that begin after age 5. Whenever an older dog begins to have seizures, and causes such as toxins, trauma and diabetes have been ruled out, the possibility of a brain stumor hould be considered. In this circumstance, and if the dog is five years old or older, a brain tumor is the most likely reason for the onset of seizures. Although seizures are one of the most alarming symptoms of a brain tumor, there are others that may give additional indications of a tumor's presence. Please keep in mind, however, that symptoms vary greatly based on the size and location of the tumor. Signs may vary from moderate to severe. Symptoms may worsen for a while, and on the other hand, may sometimes seem to improve. Some of the initial symptoms may be so transient and subtle that you may doubt that you are seeing anything at all. About six months before my dog JoJo had his first seizure, the only change I noticed was an infrequent, passing glazed expression. I also saw that he was having a hard time keeping up with me on our morning jogs. At night, he began having trouble sleeping, and would often wake up crying for attention. If your dog is over five years of age and begins to have seizures, or any other unexplained changes in personality or behavior, you may have some reason to suspect an underlying physical cause. The best course of action is to report these changes promptly to your veterinarian so that you will have the best possible chance of successful treatment. Gait - Unsteadiness, stumbling or staggering. Difficulty on uneven ground or difficulty with stairs. Personality - The dog may show unexplained aggression, or may become docile or puppy like. He may become less affectionate, or develop obsessive behaviors, like vocalizing, pacing, licking, "fly-biting" or a compulsion to eat. Mental ability -Forgetting commands, failure to recognize familiar people. Becoming lost in familiar places. Mental confusion or a glazed expression. Housebreaking accidents - Loss of bladder or bowel control in a dog that was previously housebroken. Appetite - You dog may lose his desire to eat. On the other hand, he may become ravenous. He may also forget what is edible and what is not. Sensory problems - Some dogs lose their sight, their hearing or even their sense of smell. Seizures - May range from partial (focal) to grand mal. Seizures generally become worse as the tumor gets larger. Cluster seizures (several seizures one after another over a short period of time) may develop. 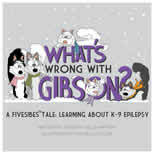 If the tumor is not treated, seizures become more and more difficult to control as the disease progresses. Fatigue - The dog seems to tire more rapidly during exercise, and may lack the energy to play as he or she used to. Pain - The dog may whine, whimper or even yipe without apparent reason. He may shake or scratch his head or rub it against objects. The dog may choose to sleep on the floor, rather than a bed, so that it can rest its head on the solid floor. Geriatric Separation Disorder - First identified by Dr. Nicholas Dodman, this problem occurs when a dog begins awakening at night for no apparent reason. The dog may whine, pace or seem restless. The dog seems to want attention, but is difficult to console. Difficulty breathing - This is an important sign if it happens while your dog is sleeping. Breathing may stop and start or seem labored. Breathing problems occur when the tumor puts pressure on the mid-brain, affecting involuntary breathing reflexes. Don't try to diagnose this yourself! Symptoms alone are not enough to positively diagnose a brain tumor. Many of these symptoms can be caused by other diseases, so you'll want to rule those out to make sure your dog receives the appropriate treatment. If your veterinarian suspects your dog has a brain tumor, but is not sure, the best thing to do is to make an appointment for a consultation with a veterinary neurologist. You can probably find one at your state college of veterinary medicine. Large clinics in major cities might also have one on staff. A veterinary neurologist is likely to have experience with canine brain tumors and access to the tools needed to diagnose and treat the disease. If you hope to extend your dog's life, don't put off this step. Early diagnosis and treatment will improve your dog's chances for a longer life. Hydrocephalus can cause a variety of neurologic signs, including seizures, incoordination, abnormal behavior, a tendency to walk in circles, and blindness. These signs may wax and wane or become worse over time. Diagnosis is based on the signs in conjunction with techniques to image the brain. In dogs with a fontanel, ultrasound can be performed by scanning through the fontanel to detect the excessive accumulation of fluid within the brain. Computed tomography (CT) and Magnetic Resonance Imaging (MRI)are also useful. Young dogs with mild signs may improve without treatment as they get older. Medication, such as corticosteroids, are sometimes helpful. In some cases, surgery is performed to implant a ventriculoperitoneal shunt. This is a device that transfers the excess fluid from within the brain to the abdomen, where it is absorbed. A porto-systemic shunt is an abnormal communication between the portal blood system and the systemic circulation that allows blood from the intestines to enter the systemic circulation without first passing through the liver. This causes the body, including the brain, to be exposed to toxins originating in the intestines. Most porto-systemic shunts are congenital, that is, present at birth. In some cases, an acquired portosystemic shunt can develop secondary to an underlying liver disease. Hepatic encephalopathy is a syndrome of abnormal brain function resulting from liver disease. In dogs, hepatic encephalopathy is most commonly caused by a portosystemic shunt, but other liver diseases, such as liver tumors, cirrhosis, and congenital urea cycle enzyme deficiency can also cause hepatic encephalopathy. Congenital portosystemic shunts are most common in Miniature Schnauzers, Yorkshire terriers, Irish wolfhounds, Cairn terriers, and old English Sheepdog, but any breed can be affected. Signs and symptoms are usually present by 6 months of age, but congenital portosystemic shunts are occasionally not recognized until middle age. Hypoglycemia is an abnormally low level of glucose (sugar) in the blood. The brain requires sugar for normal function, and unlike many other organs, the brain has a very limited ability to store glucose. This means that the brain is the organ predominantly affected when blood glucose gets too low. Hypoglycemia can be caused by abnormal function of the hormones that regulate blood sugar or the inability of the body to store adequate amounts of glucose. Specific causes include insulinoma ( a tumor of the pancreas that produces excess insulin), overwhelming infection, an overdose of insulin used to treat diabetes, and hypoadrenocorticism (Addison's disease), a deficiency in hormones normally produced by the adrenal glands. Puppies, especially toy breed puppies, are predisposed to developing hypoglycemia because they have less ability to store and mobilize glucose, compared to older animals. Stress, low body temperature, ineffective nursing, infections, and premature birth may precipitate hypoglycemia. A common cause of hypoglycemia" is inadequate handling of the blood sample. If a blood sample is taken but not tested for several hours, the glucose measurement may be artificially low. The signs and symptoms of hypoglycemia are similar regardless of the cause. These include lethargy, weakness, incoordination, seizures, nervousness, tremors, and hunger. In severe cases the dog may become unconscious. A diagnosis of hypoglycemia as a cause of neurological problems is based on three criteria: (1) The patient has clinical signs of hypoglycemia, (2) A blood glucose concentration of less than 45 mg/dl is measured, and (3) The clinical signs go away when glucose is administered to the patient. Once it is determined the neurological signs are due to hypoglycemia, the cause of the hypoglycemia must be found. In addition to a medical history and examination, laboratory tests are usually performed. If an insulinoma is suspected the insulin concentration in the blood can be measured. Hypoadrenocorticism can be diagnosed on the basis of measuring cortisol levels in the blood. Emergency treatment of hypoglycemia involves administration of glucose. Usually this is done by intravenous injection. Giving a quickly absorbed source of sugar (syrup, honey, or jam) by mouth may be effective. Care should be taken when giving any substance by mouth to a dog that is seizing or unconscious as the substance may be inhaled into the lungs instead of being swallowed. Any underlying cause of the hypoglycemia should be corrected if possible. Surgery is recommended in many cases of insulinoma. Medication is helpful in preventing low blood glucose in some patients. Dietary management usually entails frequent small meals consisting of food that is high in protein, fat, and complex carbohydrates. Paradoxically, frequent administration of smple sugars may be counterproductive as this often stimulates insulin production. This lowers blood glucose and may precipitate a hypoglycemic episode. When diabetes is associated with seizures, it is almost always due to insulin overdose resulting in hypoglycemia. Although severe, untreated diabetes can lead to diabetic ketoacidosis, which affects the brain, this typically causes stupor or coma, not seizures. Hyperadrenocorticism (Cushing's disease) usually does not directly cause seizures. Hyperadrenocorticism is usually caused by a tumor of the pituitary gland at the base of the brain. These tumors are usually microscopic, but a sub-type, called a macroadenoma, can sometimes enlarge enough to put pressure on the brain to cause neurologic signs, including seizures. In essence, this is a type of brain tumor. Also, hyperadrenocorticism can predispose to to a stroke which can cause seizures.